Journey of Bill Gets childhood to become a billionaire How ? If you don't know about Bill Gets, than I will tell you that Bill gates is an American business magnate, Entrepreneur, Investor and philanthropist.He is a founder of Microsoft company, and he is a richest person in the world. In this post I will show you bill Gets biography that how Bill Gets become a billionaire. I will show you bill Gets story childhood to billionaire. In 1955 Bill gets was born in Settle Washington United State of America. His full name is William Henry Gates. After some time Bill Gets take Admission in Lake side school. Bill gets was a very intelligent boy, In childhood he was hungry for learn new thing. In 1969 bill gates start his high school. After some time Bill Gets take admission in computer class, after some time bill had very passionate in computer. They want to know that how computer work for this Bill Gates spend many time in computer class room. After some time bill Gates met a boy who name is Paul Allen.After some time Bill and Allen become a friend. When Bill Gets only 15 year old, than Bill Gates and Paul Allen made a computer program which name is "Traf-o-Data". For this they got $20,000 that is first earning of Bill and Allen, in that time bill had Entry in technology world. When Bill 17 year old than Bill and Allen thought to start his own company, but bill's parent don't want as. They told to bill that before complete high school and take admission in collage.Because bill's father is a layer, his father wants to give law education of bill gates. In 1973 Bill Gates complete his high school education, and they found 1590/1600 marks, he introduce his intelligence.After some time Bill Gates take admission in Howard University for learned law. Allen move here and there than he found a magazine which name is popular Electronics, on cover pages of magazine first mini computer kit in the world which name is Altair 8800. This talk Allen said to Bill gates and both were very happy. Because for run Altair 880 need a software which support in mini computer. Bill and Allen had a big opportunity Bill. Bill and Allen contact company which made this computer,and they announced that they worked on a basic software programs which could run Altair 8800. Bill And Allen worked two month day or night in Howard university computer lab.After make software Paul Allen went for testing software.When the software install in Altair 8800, than the software work properly. Only 19 year old Bill Gates and Paul Allen make Microsoft company. After some time Bill gates drop his collage in final year. 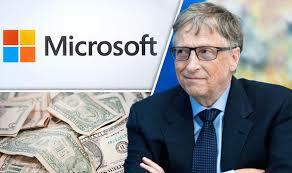 In starting time no body want to buy software for this Bill gates very often. When bill gates was very often for this than He thought that we should write a letter for every developer and programmer you can see the letter.
" Without buy software used mean stop to make new software. Than developer think that we vest our time for making quality software and gave of you"
But no effected of the people for this reason Bill Gates very said. but his Intelligence was not only making software but also growing business. When Microsoft sold out 1 million than some people know about Microsoft and some people come to Microsoft company for job.And increase his employ. 'Now a day bill gates is first position on world richest person. His Net worth is $ 90 billion.